Tag line: "Suddenly the word is Alphaville... and a secret agent is in a breathless race against the Masters of the Future"
This 1965 Jean Luc Godard film, set in a nightmarish city of the future, stars Eddie Constantine as Lemmy Caution, a spy from the Outlands sent to the high-tech society of Alphaville to assassinate its founder, Dr. Von Braun (Howard Vernon), and destroy the Alpha 60 computer, an advanced system that controls the entire town. Together, Dr. Von Braun and the Alpha 60 have eliminated all free thought and expression in Alphaville. In fact, to display emotion of any kind is forbidden, and those caught doing so are immediately arrested and put to death. In an attempt to gain access to his targets, Caution cozies up to Von Braun’s daughter, Natacha (Anna Karina), but somewhere along the line, falls in love with her as well. This, of course, sets the Alpha 60 in motion, trying to track down the source of these "illegal" feelings. With both his life and Natacha’s in danger, Caution must now concentrate his efforts on stopping the Alpha 60 before it's too late. Aside from the Alpha 60 (which, truth be told, isn’t the most impressive-looking computer system), there's nothing even remotely futuristic about Alphaville; the movie was shot on the streets of Paris, and has zero special effects. What it does have, however, is a distinctly film-noir vibe, what with its stark black and white photography and a lead character who, in his hat and trench coat, could just as easily have leapt off the pages of a Mickey Spillane novel. 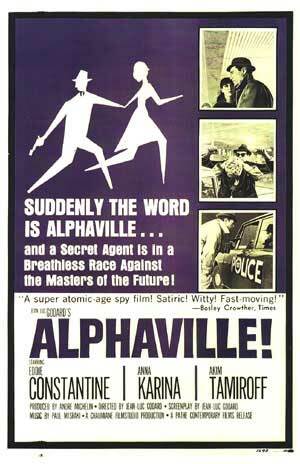 Yet while the look and feel of Alphaville won’t draw any comparisons to the Star Trek Universe, its central theme, the suppression of ideas and emotions in a dystopian society, fits the sci-fi genre perfectly, and was even explored by fellow New Wave director Francois Truffaut in his 1966 movie, Fahrenheit 451. Taking place in the future, yet looking every bit like a 1940’s detective movie, Alphaville is the kind of sci-fi story that only Jean-Luc Godard could tell. What a crazy film, and pretty amusing once you get past the techno-babble and figure out what Godard is up to. Pretty stylish if nothing else. @Klaus: Thanks for stopping by, sir, and leaving a comment! I agree: it's a crazy movie, and very stylish. Might be a tough watch for people nowadays, but I liked it! I haven't seen it but I will search for it Now.